You can select sites, ad networks, and the position of the banner in relation to the page contents. With this setting, you must indicate the sites where your banners will display. Selected or excluded sites may display under the second tab depending on the product group that was selected. 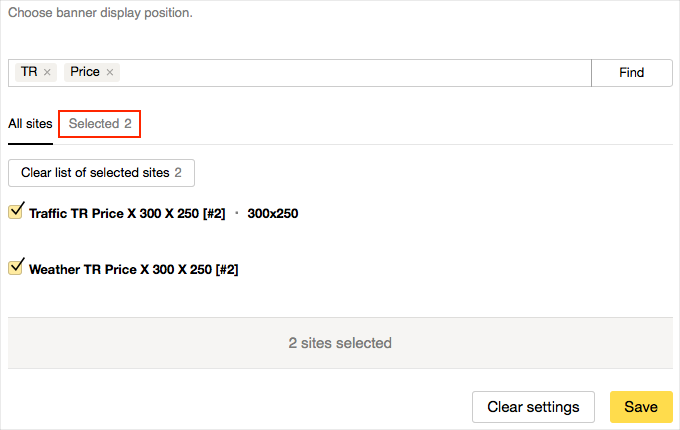 If no sites were selected initially, then check the box next to the sites where you want your banners to display. You can use the search to clarify site names. The search works using the “AND” operator (so combinations that satisfy all conditions simultaneously are selected). You can view selected sites on the Selected tab. You can view excluded sites on the Excluded tab. An ad network is a collection of specific sites. When you select ad networks, pay attention to the notification that displays at the top of the screen in black. The networks and banner formats you chose may not be compatible. This means that some banners may not display. The notification includes a list of formats that are not compatible with any of the chosen ad networks. The notification includes a list of networks that aren't compatible with the chosen banner formats. 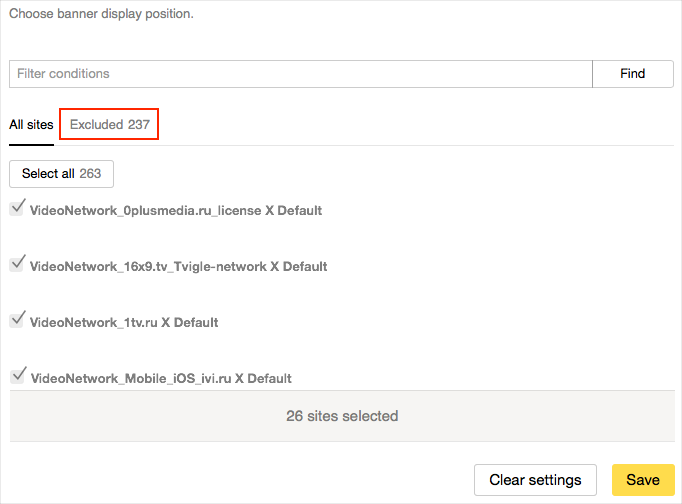 This setting determines your video ad parameters: ad block type, position within ad block, and TNS brand rotation.